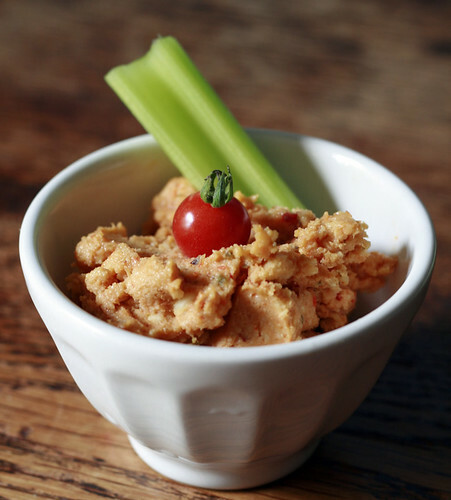 One of my all time favorite snacks since childhood has been pimento cheese. It’s delicious on celery sticks, crackers, on a sandwich with slices of tomato… I didn’t realize this was specific to the South until I moved away from the South at the age of 26. And even then, it took a couple years for me to really start to miss it. I remember searching in every grocery store in Seattle and I couldn’t find it anywhere. I asked friends and no one knew what I was talking about. It finally occurred to me how privileged I had been up until that point. 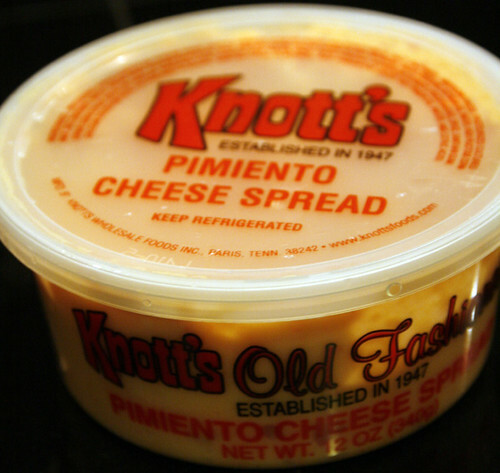 Every trip home there after, my Mom stocked up on our favorite store bought brand, Knott’s, and she often sent me home with some (no matter how inconvenient it was to transport). I assumed it was from South Carolina and am only now realizing it is made in Paris, Tennessee, since 1947! When I met Grant, who is Pacific Northwest by birth, he didn’t know much about pimento cheese but he desperately tried to make it for me. It was always good but not quite right. I think we were trying to be a little too healthy with our ingredients quite honestly. I’ve been wanting to make a more authentic version for a long time and finally started researching different recipes. 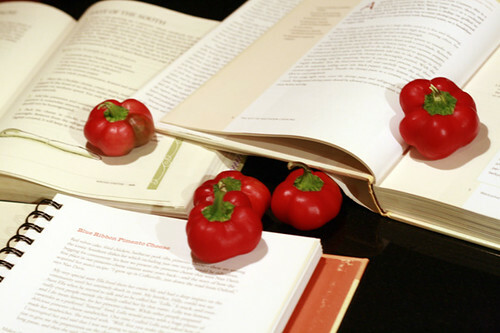 I even grew my own pimentos this year in preparation! My Mom says my Uncle Joe used to make homemade pimento cheese all the time and very simply- sharp cheddar cheese, jarred pimentos, and mayonnaise. Of course, all the classic recipes I found call for mayonnaise to which I am not a huge fan. I know, it’s completely non-Southern of me to not want to slather everything with Duke’s mayonnaise. I came to a compromise here and decided to make my own mayonnaise using olive oil. I have realized lately that I no longer care for the taste of canola oil. The olive oil may be a bit too strong for this but I sort of liked it. It does cause the pimento cheese to get a little too firm in the refrigerator so just be sure to take it out for a few minutes to let it get the chill off before you serve it and it will soften. You can definitely substitute a more neutral oil. I adapted this recipe from a New York Times recipe. 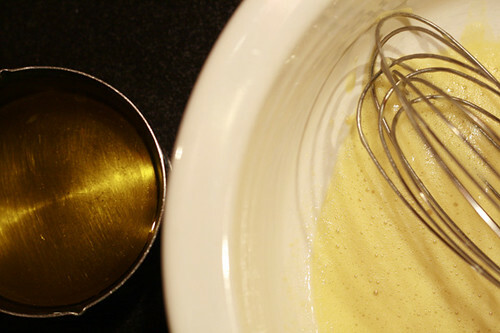 In a medium bowl, whisk together all ingredients except the oil until frothy. Whisking constantly, slowly drizzle the oil in until the mayonnaise is thick and all ingredients are well mixed. For my Pimento Cheese, I also decided to throw a jalapeno into the pimento mix to spice it up a little. I tossed the peppers with some olive oil and roasted in the oven at 375 for about 20-30 minutes. I wanted them nice and roasted but not charred. 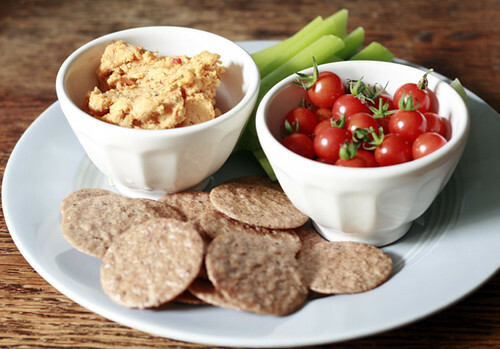 Pimento Cheese served with Pecan Nut Thins, Celery, and Tomatoes. Cut the cheese into small pieces and blend well with the other ingredients. 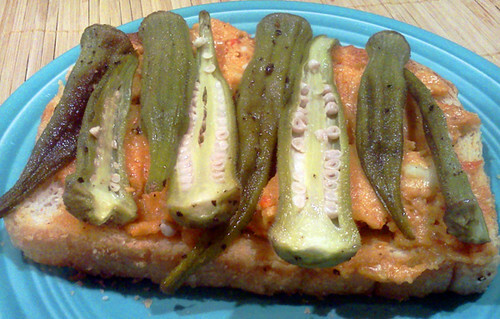 New favorite way to enjoy pimento cheese is on a piece of toast with some roasted okra! Pimento cheese is one of those “slice of Americana” foods to me. And speaking of Americana, this past week was the Americana Music Association’s big conference in Nashville. 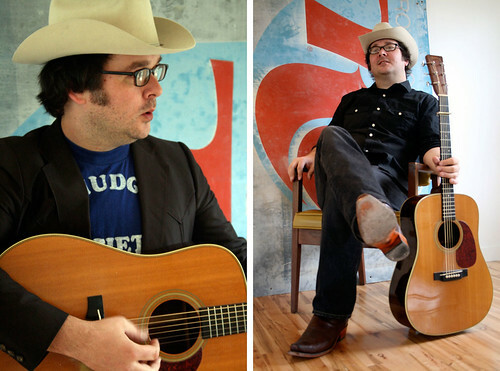 This is the week every year when tons of Americana bands and artists all converge here to showcase their music, attend the big awards show at the Ryman Auditorium, and attend workshops and lectures all week. It’s pretty fun. And, it gets bigger every year. Having so many like-minded folks visiting our fair city all at once and sort of feeling like Nashville is on display always makes me realize just how lucky I am to live right here in Nashville surrounded by so many amazing musicians, songwriters, and creative folks. We are so fortunate to have opportunities to see so many amazing world-class musicians on every day of every week. One of those talented songwriters is our buddy Derek Hoke. He has a brand new album out and I think you need to have a listen. It is rapidly rising to the top of the Americana Association’s Music chart. His album, produced by Dexter Green, features some of the best musicians in town. His live band is exceptional, as well. Here’s a link to a recent interview on NPR with Melissa Block.